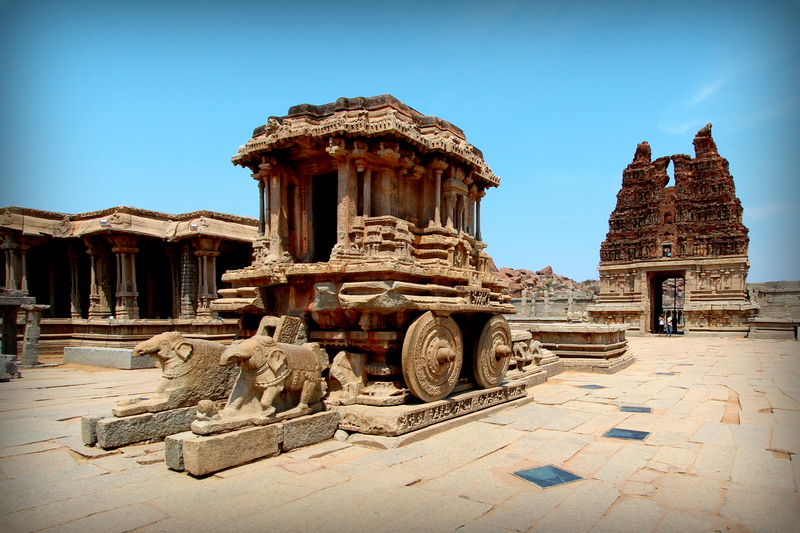 Until this year, I had never visited Hampi before. I hadn’t heard too much about it until I stayed in Bangalore – being only a 6 hour drive away, it’s the perfect candidate for a weekend trip from Bangalore. I left for Hampi with very little expectations and was pleasantly surprised by the depth of its offering! Hampi is not only home to a plethora of ruins now marked as a UNESCO World Heritage Site, but boasts beautiful scenery and breathtaking views, an unmistakable mythological past and some of the most friendly locals I have met throughout India. 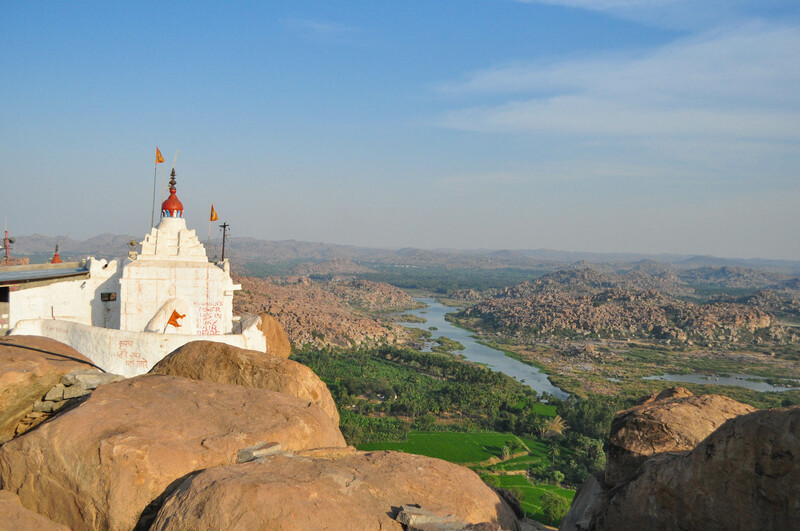 The name “Hampi” is the Anglicized version of the Kannada word “Hampe,” which is derived from “Pampa,” the old name of the Tungabhadra River that runs through the city. 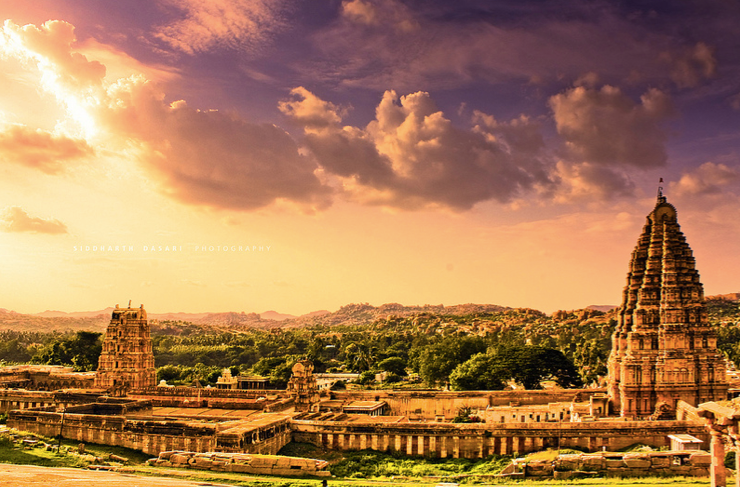 Hampi is located within the ruins of Vijayanagara, the former capital of the Vijayanagara Empire, and has a strong association with the great Indian epic Ramayana (see previous post). To really enjoy Hampi, rather than packing your weekend with seeing all of its attractions, I would recommend taking it easy, seeing only some of these and exploring the more untouched parts of the village. Start the weekend off early with a South Indian breakfast at your homestay. Leave for the Anegondi village, which is less commercialized than the main Hampi Bazaar, so you can see how locals live and some small ruins and temples. After this, walk over to the village boat jetty, where you can cross the Tungabhadra River on a communal boat. 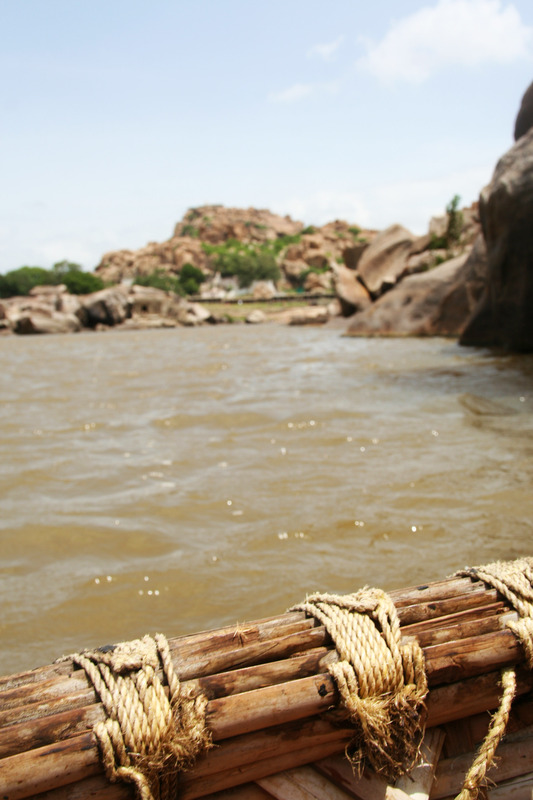 An experience you will not want to miss is taking a coracle boat ride on the Tunga river. A coracle boat is a round, shell-shaped boat made up of interwoven bark (almost like a flattened basket) and is the preferred means of crossing the river for villagers. During my trip, we went on a coracle boat ride through the river and stopped at a secluded cave to eat a delicious home made lunch. I’m not sure if it was the serenity of the whole experience, or being taken to a little nook so untouched by commercialization, or just the warmth of the locals – this experience was the highlight of my trip! After lunch, head to the stunning Virupaksha Temple, the oldest temple in Hampi dedicated to Lord Shiva (who known as ‘Virupaksha’ here). The complex itself is vast, so take your time to explore – it’s actually nice just to sit in peace and soak in the beauty of the construction. Just before sunset, head over to Anjanadri Hill, which is believed to be the birthplace of Hanuman, one of the key characters in the Ramayana. The hill is easily spotted from a distance as a massive mound of boulders with ziz-zag of white stairs going up the hill and a white temple at the top. The hike up is fairly easy – a cool 570 steps, so budget about 45 minutes so you can reach the top before sunset. Be prepared with water and snacks as there are no shops at the top – and for siting some monkeys on your way up! When you arrive, you will see the white washed Hanuman Temple as well as the spectacular sunset views of Hampi. The scene at sunset was quite stunning – I sat there for about an hour, mesmerized by the sun setting in the horizon and the silhouette of a sadhu meditating on the neighbouring boulder. After sunset, head to Virapupur (Hampi Island) to explore a very different side of Hampi – you’ll find a street full of restaurants and shacks with a chilled-out, hipster vibe that is reminiscent of the beaches of Goa. Try the Laughing Buddha, a quaint little restaurant with great views, plenty of cushions to lounge on and a great mix of Indian, continental, Israeli and Chinese food. Start your morning off with another simple, South Indian breakfast at the homestay. Head over to the Vittala Temple, a 16th century construction that is arguably the most well known of all the ruins in Hampi. You’ll notice the absence of cars around the temple – the government has embarked on a great initiative that uses battery-operated cars driven by an all female crew to transport people inside the complex. The complex is home to temples, pillars and halls, as well as the famous chariot that sits in the centre. After your visit to Vittala, head over on a scenic bullock cart ride through the farmland and village, finally stopping at a shaded site by a stream. Here, you can enjoy a vegetarian lunch, prepared by village women with fresh local ingredients. After lunch, head to a local jaggery factory, where you can see local farmers extract sugar cane juice and boil it in a large cauldron – you can even join them in the activities! End your weekend with some fresh sugar cane juice! Travspire currently offers experiences in Hampi – if interested, you can book here or contact us for a customised trip!